A businessman from Zhejiang province, who was arrested in Colombia over allegations he fled the mainland after leaving debts totalling millions of yuan, was repatriated to China yesterday. The case is the first time the mainland has extradited an economic fugitive from a Latin American country, China News Service reported. The 35-year-old suspect, whose surname was given as Wu, was arrested in Colombia on August 28, it said. He owned a trading company in Yiwu city and reportedly fled China on a flight from Shanghai‘s Pudong International Airport on September 9, 2012. He had allegedly left unpaid debts totalling more than four million yuan (more than HK$5 million). Zhejiang police launched an investigation into Wu about a month later, and order for his arrest was issued in December 2012. After cooperating with Interpol, Zhejiang police discovered in July that Wu was in Colombia, said Ding Pinglian, of the Zhejiang provincial police bureau. Four police officers were then sent to Colombia to assist with Wu’s arrest and extradition. Wu is expected to stand trial in Yiwu, China News Service reported. A total of 11 people suspected of economic crime have been repatriated since the Ministry of Public Security launched a campaign to return fugitives in July, the report said. The ministry said last month that more than 150 mainlanders suspected of economic crimes were in the United States, which had become the “top destination” for Chinese fugitives. via Businessman caught in Colombia is China’s first economic fugitive extradited from Latin America | South China Morning Post. Zhejiang Province is administering a swim test for its cadres, but not for the purpose you might think. 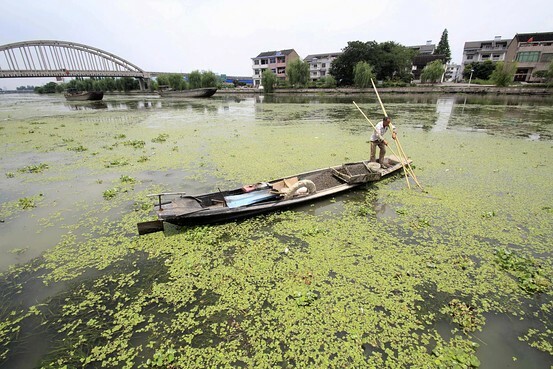 The coastal province is trying to get officials to jump into local rivers as part of an effort to battle China’s notorious water pollution. “The public doesn’t get to know what water standards are from data, but from using it. Swimming can be used to judge this, (and) leading officials should do the test,” Zhejiang People’s Congress deputy director Mao Linsheng said at a recent meeting (in Chinese). It’s not clear exactly what the province hopes to accomplish with the new initiative. There’s a rich political symbolism associated with leaders swimming in rivers in China thanks to Mao Zedong, who took a famous dip in the Yangtze River in 1966, accompanied by a team of bodyguards and 5,000 admirers, to prove he was still robust on the eve of the Cultural Revolution. But the destruction wrought in the decade following the Great Helmsman’s swim makes it a dubious template for today’s officials. There’s also the question of whether Mao would be willing to swim in any of China’s rivers were he still alive today. Nearly 60% of China’s water is either moderately or seriously polluted, according to the Ministry of Land and Resources’s annual report released this April. Pollution in Zhejiang appears particularly problematic. Last year, CCTV reported that more than 80% of the waters just off the coast of Zhejiang Province were polluted, threatening the local fishing industry. In March, a river in the city of Wenzhou in Zhejiang caught on fire as a lit cigarette set alight chemical residues floating on its surface. via Who Needs Science? China Province Orders Water Pollution ‘Swim Test’ – China Real Time Report – WSJ. The number of applicants for civil service jobs has dropped in most places so far this year, according to information released by provincial-level governments. Sixteen of the 18 provinces, municipalities and autonomous regions that released employment information on Thursday saw a decrease in applicants year-on-year. The number of applicants in Zhejiang province was down 37 percent from 360,000 last year to 227,000 this year, according to the human resources and social security department. Most other provinces saw a decrease of between 10 and 30 percent this year, the Beijing News reported. Only Shaanxi province and the Inner Mongolia autonomous region have seen increases in the number of applicants this year. Meanwhile, 15 provincial-level governments have cut the number of civil service positions available. The number of posts in Zhejiang province, for example, is about 1,500 less than last year. Civil service jobs have long been deemed ideal for many college graduates. The central authorities, provincial-level governments and city governments respectively recruit civil servants once a year. In 2013, for example, 1.52 million graduates took the national civil service exam. On average, about 77 applicants competed for each available position. The most desirable posts saw a competitive ratio of 7,192 to 1. Gu Ruocun, a graduate from Shandong Normal University who works for a private company, said that more than half of his classmates applied for positions in the provincial government last year. “In my opinion, civil service is a decent job with decent pay,” he said, adding that he is preparing for this year’s application exam after failing a year ago. Xu Yaotong, a professor of public administration at the Chinese Academy of Governance, said that the central government has begun reforms to streamline public agencies. Local governments will tend to follow suit to decrease the number of new civil posts, Xu said. The decrease in applicants this year shows that the public has been changing its attitude toward such jobs, he said, adding that it is good news that more young people want to work outside of the government. via Civil service jobs in less demand – China – Chinadaily.com.cn. Not what he asked for but more than originally offered – ends the stand-off. 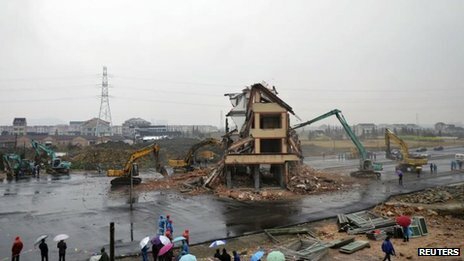 BBC: “A five-storey home marooned in the middle of a new road in China for more than a year because its owner refused to leave has finally been demolished. The road, in China’s’s eastern Zhejiang province, was built around the house because duck farmer Luo Baogen was holding out for more compensation. Mr Luo, 67, said he had just finished the home at a cost of $95,000 and had been offered only $35,000 to move. Officials say he finally accepted $41,000, and the bulldozers moved in. The home had earned the nickname “nail house” because, like a stubborn nail, it was difficult to move. via BBC News – China home marooned in middle of road is bulldozed. Thanks to Reuters for discovering this ‘gem’. Reuters: “Chinese Communist Party leader Hu Jintao‘s opening speech at the ongoing 18th Party Congress was a disappointment to many listeners, offering no major signals that the leadership is willing to advance political reform. The 64-page keynote speech he delivered was couched in the usual conservative and Marxist terminology, but one paragraph buried deep in the text was just what proponents of a long-running experiment in public policy consultations have been waiting for. The section in question urged the ruling party to “improve the system of socialist consultative democracy”. Academics and officials say the mention of “consultative democracy” is the first ever in such an important document, and it is seen by some as a strong endorsement of the long-standing experiment with this form of democracy, in Wenling, a city of 1.2 million in Zhejiang province, south of Shanghai. The city has formalized public consultation on public projects and government spending at the township level, although there is no voting and decisions remain the preserve of the state machinery. Xi Jinping, almost certain to be named the next party general secretary on Thursday, was party boss in Zhejiang in 2002-2007, as the Wenling project deepened. The congress report is the most important political speech in China. Delivered once every five years by the party’s general secretary, it sets down political markers and charts a development course for the coming five to 10 years. “Of course this is a good thing,” said Chen Yimin, a Wenling propaganda official who has been a driving force behind the system of open hearings, where citizens can weigh in on things like proposed industrial projects and administrative budgets – providing at least a bit of check on their local officials. “This shows that the democratic consultations… that we have been doing for 13 years since 1999, have finally gained recognition and approval from the centre. It opens up space for further development. It says our democratic consultations are correct,” he said by phone from Zhejiang. Chen Tiexiong, a delegate to the congress and party boss of Taizhou, the city that oversees Wenling, which itself has rolled out Wenling-style consultations in recent years, agreed. via Buried in a bleak text, hope for a Chinese political experiment | Reuters.